Description and Definition of a Flint Knapper. Who was a Native American Flint Knapper? 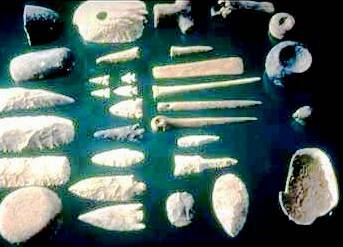 A Native American Flint Knapper made weapons and tools using the stone called Flint. The tools and weapons made by a Native American flint knapper included arrowheads, projectile points for Spear, hand axes and tomahawks. The role of the Native American Flint Knapper was extremely important in all the Native Indian tribes. One of the most important roles of the men was to make weapons for hunting and for fighting and the majority of the men had these skills. However, there were some who had the ability to work exceptionally well with flint, recognising the best place to create a break in a 'core' piece of flint to produce the most effective tool or weapon. Native American tools and weapons came in all shapes and sizes. The skill of the Native American Flint knapper was critical to the well being of his family and the tribe as the implements he produced touched every aspect of their daily lives providing articles to use when hunting, fishing, making clothes, making homes and shelters and canoes and travois. The role of the flint knapper was critical to the well being of each tribe across the whole continent of North America. Each flint knapper worked with the raw materials available to him and his task was to provide whatever the tribe needed to survive their particular climate and lifestyle. There were many stages to making a weapon such as an axe or a tomahawk. The weapons almost always utilized stone in some way and flint was the most effective stone to use when making a weapon. The flint knapper made weapons from flint rocks lashed to wooden hafts to create axes and tomahawks, flint knives and stone arrowheads. Although made of stone these primitive weapons were still deadly. The stages and process followed by a flint knapper in making an axe is charted in the following table. For additional information refer to Stone Tools. The flint knapper would travel to locations where there were known sources of flint. It could be found along rocky riverbeds, on beaches and in chalk rocks made of a soft limestone. It was also found as fillings in cracks in other types of rock. Stones of Flint are easy recognised as they are often covered by a thin white layer and, in contrast to other small rocks and pebbles, have an irregular shape. The surface of flint is also smooth and not grainy as most other rocks. Colors varied but included black, white, brown, gray, reddish and green. Flint was used to make tools and weapons as it splits into thin, sharp splinters called 'flakes' when struck by another hard object such as a hammerstone. Flint Knapper Task 5 Working at the 'Anvil' Each knapper would have a special place to make tools and weapons. 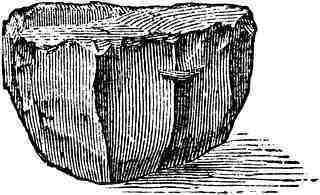 An Anvil is the word used to describe a rock that was used as a level base for chipping other stone into tools, blades or arrowheads. Flint Knapper Task 7 Using the Hammerstone A hammerstone was a hard, often oblong or rounded stone which fitted neatly in the knapper's hand and used as a prehistoric hammer. 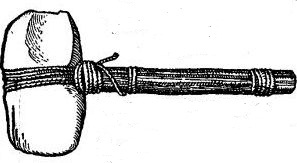 The objective of the knapper was to reduce the size of the original flint, called the core. The knapper would pay close attention to natural flaws and batter the core with the hammerstone to reduce its size. Flint Knapper Task 9 Pressure Flaking The next step is called pressure flaking. The objective of pressure flaking is to shape, refine and create a pointed weapon, like an axe. Pressure flaking is achieved by placing a pointed tool, such as an antler horn or piece of bone on the edge of the stone, and applying an inward pressure to the tool to remove a small, thin flakes from the stone. It might take up to eight hours to produce an axe head. The use of fire (refer to Making Fire) was also used by the Native American flint knapper to heat and alter a stone preform to improve its working characteristics and flaking qualities prior to knapping and flaking. In heat treating the stones would be heated slowly over several hours in a sand-lined firepit. The stones were then allowed to cool slowly. This heat treating process which enable the flint knapper to easily flaked with well directed blows. 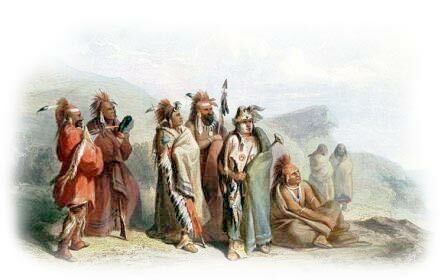 The Stone Age life style of Native Americans ranged from nomadic, semi-nomadic to static across the vast continent of North America and despite this many of them shared similar culture and tools and weapons produced by the Flint Knapper. Discover the interesting facts and information which relate to the History of Native Americans and the tools and weapons they used. The pictures on this site show the tools and tools that were used by various Native Indian tribes that can be used as a really useful educational history resource for kids and children of all ages. We have included pictures and videos to accompany the main topic of this section - Flint Knapper. The videos enable fast access to the images, paintings and pictures together with information and many historical facts. All of the articles and pages can be accessed via the Native Indian Tribes Index - a great educational resource for kids providing an unusual insight into their culture. We hope you enjoy watching the videos - just click and play - a great resource for gaining facts and information about the life of Native American Indians.